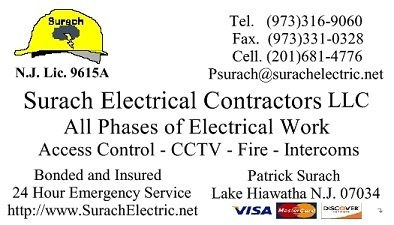 Surach Electrical Contractors will like to welcome you to our website. We have been serving Northern and Central New Jersey since 1989. We provide all phases of electrical work with high quality service. We offer prompt professional service at reasonable rates. We feel our expertise will be mutually beneficial as customer satisfaction is our #1 priority. We are fully licensed, bonded and insured. As a courtesy to our customers we provide flexible working hours, which include Saturdays at no extra charge. We also offer 24 hour emergency service. We can be reached at (973) 316-9060 and by fax at (973) 331-0328.